One of my favorite junk-era sets is Fleer’s 1990 issue, which marked their 10th Anniversary of producing regular-issue card sets. The clean design, the awesome-for-1990-prospectors rookie crop (10/10 on the nostalgia scale), the inserts (Soaring Stars are great-looking cards), and the interesting batch of errors and variations within it, are all reasons for me to continue breaking a box here and there. 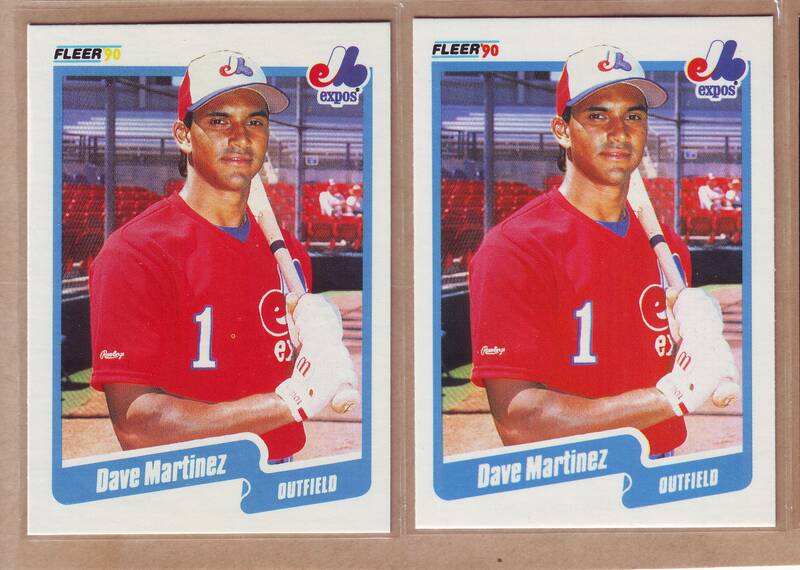 But 1990 Fleer also holds one of the rarer error cards of the junk-wax era, card #353, Dave Martinez, was originally printed with the little ’90 by logo, in yellow, rather than red. Very few of these were produced, though how many remains ambiguous. Though nothing is certain, it was my understanding that these cards were found in a specific type of retail packaging very early on in the run. Again, since such little information is out there on this card, it’s origin of distribution remains a mystery. As I touched on earlier, this card was (is still?) priced in the Beckett guide at $2. I’ll take 50 of them, please! Over the majority of the last 20 years of watching magazine buy/sell ads, sportsnet and ebay auctions, I was unable to find a copy for sale. Until around 2007, when a copy sold for a buy-it-now of $7 (a BIN I missed – needless to say, that was an ugly day at my house). Likely due to the seller setting the BIN based on the hilarious Beckett price of $2 at the time. It wasn’t until a year or so later, that I found a small group of these for sale on the Beckett Marketplace site and quickly grabbed them up, sight unseen. A few have popped up since then. I want to say somewhere between 2-4 copies, an unbelievably small amount in comparison to how much 1990 Fleer was produced and far fewer than the 1989 Fleer Jeff Treadway Target variation – another Fleer variety known for it’s scarcity. The few I owned sold at auction between $70-100 (roughly) a piece but the handful that sold after those, sold much lower, likely due to a number of factors, not indicative of the card’s actual scarcity. Obviously, the price is one of those made-up-because-we-want-to-acknowledge-it-but-have-no-idea-what-it’s-worth entries into the annual guides like the 1990 Upper Deck Mike Witt. Even the most recent sale (within the last 18 months), somewhere around $25, is very conservative and most likely due to a poor market and ebay’s dwindling reputation as an auction site and it’s apparent change toward an online outlet mall. If you have the chance to own one of these, and the price isn’t outrageous, I’d go for it. 20 years and counting, and less-than 10 known examples circulating (and yes, I’m sure several more traded hands back in 1990 and that more than 10 are out there), makes this a very difficult variation to track down – if this were a Topps issue, it would be trading at the 1980 Fred Stanley levels. Let’s hope the price guide editors take notice, give this card a little love and update the price to something that resembles the scarcity of it. Once that happens, who knows, maybe more will pop out of the woodwork? Categories 1990 Baseball, Cards you've never seen, Info, Rumored Rarities, Where did this come from? 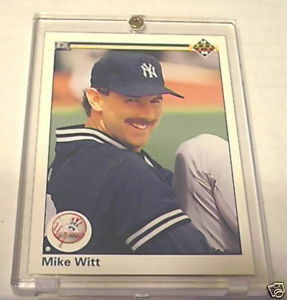 Quite possibly the ultimate Junk Era Gem or Hidden Treasure card, the legendary 1990 Upper Deck Mike Witt #702A with black box on back is one of the scarcest variations produced in the modern era,* and until more info shows up to say otherwise, it’s one of the scarcest error cards of all. *UPDATE: as of May, 2016, this statement is no longer true. An 800 count box of the Witt #702 was discovered at a flea market in California. See other Witt blog entry for further details! Very little is known about this card. As of 20 years after it’s release, no concrete source of it’s distribution exists. Did it come from packs? Many say yes, but with vague memories or telephone-game-like recollections of the origin of their example. Was it found in 800-card factory sets? A popular claim for many years but a claim that may have sprung about by unscrupulous dealers looking to move a glut of backstocked sets. Did they slip into the Hi # factory sets? I know that I have heard from a number of sources over the years that this was the only place that they were found, but again, there have been no recent, reliable breaks that have uncovered a copy. -Was pulled from production early and replaced by the “Rookie Threats” card depicting the three 1990 rookie players on the Montreal Expos. -A black, rectangular box was placed over the back of the card. -A checklist card #800 has reportedly been discovered with a similar black box on one of it’s sides (Beckett). I find this card very intriguing because I do not understand why it was pulled from production. While the Montreal Expos had three young talents at the time, none of them were enjoying a ‘stop-the-presses’ type season – also consider that each had already been represented in the set. Several other stars and rookies would’ve made a more logical replacement: Frank Thomas, Travis Fryman, Scott Erickson, Dale Murphy (in a Phillies uniform) are all absent from the set. Fernando Valenzuela and Dave Stewart’s dual July 29th no-hitters, a first-ever for major league baseball, would’ve made for a more important “special” card than the Expos guys. What about that checklist #800? Beckett notes that checklist cards have appeared with the black box on them. Has anyone ever seen a copy? I know I have not but I’ve also didn’t work for a major hobby publication at the time of the sets release. Since 1998, I have kept my eyes open on internet trading and auction sites and have yet to see a single copy. Visiting card shows since the 1991 National in Anaheim has not turned one up either. Is the black box covering something up? After card seasons that saw the Bill Ripken, Jim Nettles and Fred Marion variations, it’s hard not to wonder what the box may be covering up. Granted, I have been given no reason to believe there is, but since no one has come forward with any inside information on the card, specifically as to why it was pulled, since there is no apparent reason, at this point, it’s not impossible that something is being covered up. If the black box exists as a way for production workers to instantly recognize the card and remove it before pack-out, then wouldn’t that mean at least one Witt #702 exists without it? 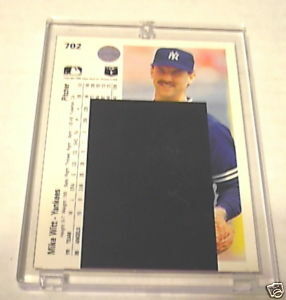 It would seem illogical for Upper Deck to produce sheets with black boxes already on them. So wouldn’t it stand to reason that some sheets must have been printed without the black boxes prior to their application? If so, who has them? Anyone who’s read Card Sharks by Pete Williams knows that UD’s CEOs were very aware of the collectabilty of their error cards – often printing up many for themselves once the secondary market established itself for certain issues (i.e. 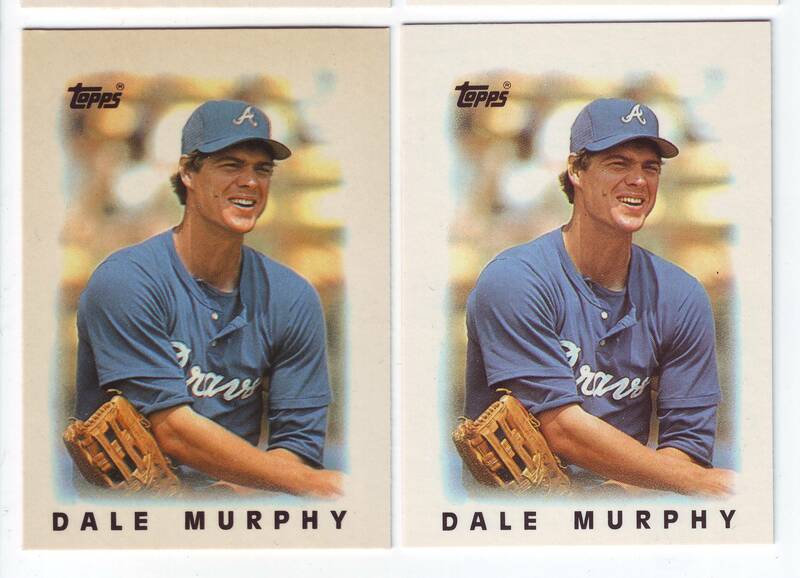 Ben McDonald and Dale Murphy errors). Does Richard McWilliam have a brick of the Witt cards sitting in a vault somewhere? It seems as though some of these guys would’ve started listing them by now but we really only get about one or two every four or five years on ebay. Still, I find it hard to believe that UD would destroy the withdrawn cards and unfortunately, it may take until they sell of their assets for the Witt cards to finally start showing up in the market. If anyone has any information regarding the card, I’d love to hear it. This is one of the few fascinating cards from a time that most people look back on rather poorly. Surely there has to be someone out there who has the answers. Categories 1990 Baseball, Info, Quick looks, Rumored Rarities, Where did this come from? 1986 Topps Mini Leaders Tiffany set? Parallel, Test Issue or Variation? A little while ago, I stumbled across an unusual batch of 1986 Topps Mini Leaders. Unlike the common type, these had an almost brownish tint to the card fronts, so naturally they jumped out at me. -A much thicker coat of gloss. Almost a laminate, quite like the familiar Tiffany issues from Topps’ 1980’s and early 90’s sets. The regular cards themselves have more gloss to them than say, a 1986 Topps base card, but these have a noticeably thicker coating of it. -The card-stock they are printed on is the same type used for O-Pee-Chee sets produced during this time. This cardstock is also used for the hugely popular 1985 Topps Mini Test cards and is also referred to by collectors as ” Vanilla Bean , ” due to it’s grainy and beige colored stock. 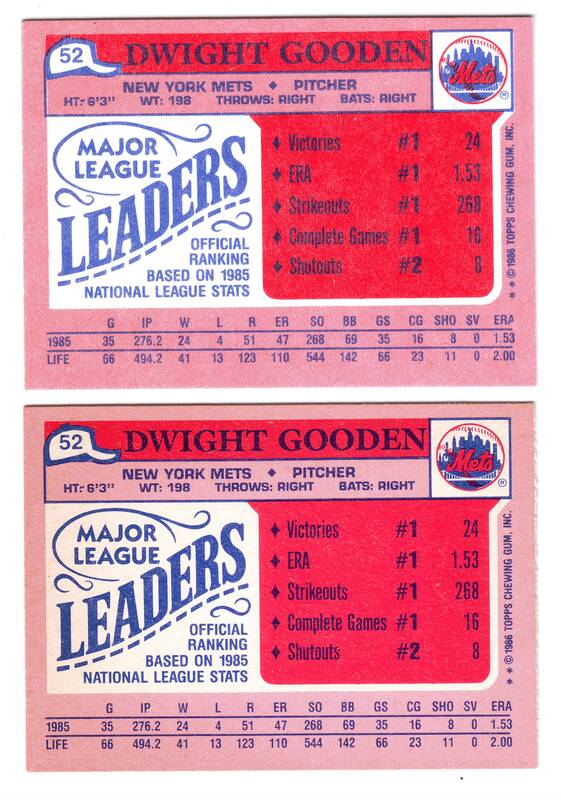 The regular issued ’86 Mini Leaders are printed on a vibrant, white card-stock, the same type used for Topps’ Traded boxed sets. -A very notable brownish tint exists on this mystery variety.This likely due to the combination of the grainy vanilla-bean stock coupled with the thicker gloss. The difference between the two types is striking when compared in person. Below, are scans of side-by-side examples of this variety, however, I have to emphasize how difficult it is to capture the differences (especially considering that viewing them at their sides gives the best perspective of their card stock differences) in a scan. Ive tried numerous methods, but some of the subtleties are lost no matter what. Keep in mind that these are not simple color/inking variations in the printing quality. That was my first thought when I found the initial batch, but after a good look over, its obvious that this is a separate issue. Since, I’ve only found a portion of the set, I cannot confirm if the entire set exists in this strange variety. I’m interested in finding out more about these. If they are more common than they appear to be based on my own investigations. When looking through current 1986 Topps Mini ebay listings, I do not see any available, and although it’s hard to tell for sure, they do stick out enough to get a good idea. If the seller has provided a scan of the back, you tell right away by looking at the white area on the reverse. I’ve tried auctioning them on ebay, noting their ambiguous origin and providing clear scans but they didn’t receive much interest, which I contribute to the lack of information on them. Hopefully, I can get the attention of the Price Guide editors one of these days and at least get a blurb in the annual regarding them, and eventually maybe even acknowledgement by PSA for the registry collectors. Categories 1986 Baseball, Info, Unlisted Oddities, Where did this come from?